Jennie hid her secret from me for quite a while. Maybe she hid it from everyone? Maybe she has more that I don't know about yet! Jennie M Whitford is my 2nd great grandmother. 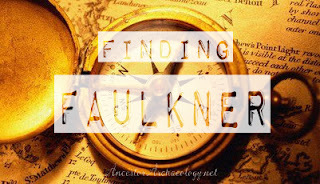 She married my 2nd great grandfather Harrison "Harry" Faulkner and had 3 sons with him. The middle son is my great grandfather Dr. L A Faulkner. Jennie (Whitford) married Harrison Faulkner in Grass Lake MI on May 1st, 1856. She was 21 and Harry was 27, according to the (very difficult to read) marriage book. Witnesses were Henry B Halbert and Mrs Mary Jane ---- (?) I found Henry - he was married to an Elizabeth not a Mary, so not husband and wife - perhaps friends of the couple. Harry had lived in Grass Lake since 1834, I don't have any idea where Jennie came from! By 1859 the couple was living in Faribault, MN. Their first son, Arthur, was born there in February of that year. The 1860 census shows the young family - here's a screenshot of the record - the census was broken up onto two pages. Says Jennie was born in Ohio. Good to know. But who are James Nichols and Sarah Woodford? Like you, my first thought was Woodford/Whitford - Sarah could be Jennie's sister! 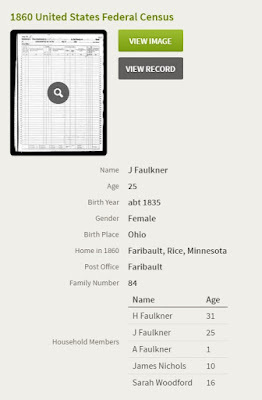 Viewing Sarah's entry, it states that she was born in Michigan - which could explain how Jennie ended up in Grass Lake. But who the heck was James Nichols? (Also born in Michigan?) A step brother? A nephew? Looking at the 1870 census Jennie is listed as being born in Michigan (!) and neither Sarah nor James are in the household anymore. The other two sons, Lloyd and Louis are there, having been born in the decade between 1860 and 1870. A quick search for a Sarah Woodford/Whitford brought no promising results - oh sure, there was a good rabbit hole or two, but in the end nothing conclusive. Putting a pin in Sarah, I briefly moved on to James with similar results. The 1880 census brought a surprise! Jennie and Harry had gotten a divorce! And, Jennie was back to being born in Ohio. An additional promising clue, her father was born in Vermont, her mother in New York. FNU Whitford born Vermont c 1800 might bring a few hints ...... another pin to revisit later. Moving forward was relatively simple. Jennie lived for a time in Chicago (Chicago City Directories 1884-1885) with her son while he attended medical school, then after his graduation in 1884, returned to St Paul MN where she remained until her death in 1888. 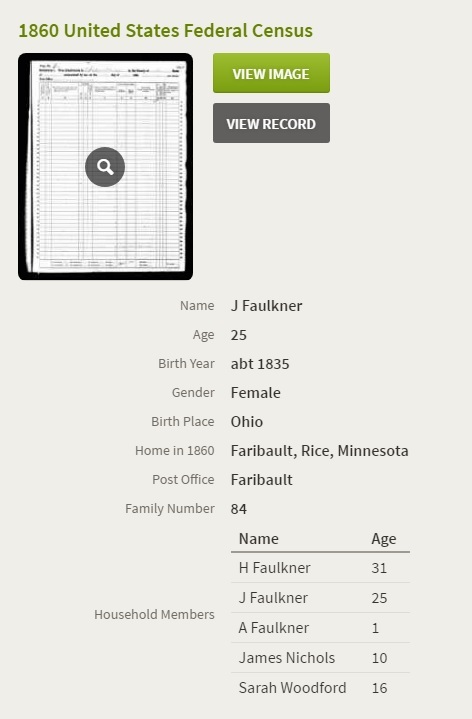 The Dalby Database lists a notation for her obituary: "FAULKNER - JENNIE M. MRS - FARIBAULT REPUBLICAN - 29/FEB/1888 - DIED, IN ST. PAUL, FEB. 29TH, AGED 53 YEARS. THE REMAINS WILL BE BROUGHT TO FARIBAULT THURSDAY MORNING FOR BURIAL" I have not been able to find where she is buried and strongly suspect cremation, ashes unknown. OK. So Jennie Whitford appeared in Michigan in 1856 and died in Minnesota in 1888. Where was she before 1856? Ohio? How did she get to Michigan? Who were her parents? Where was she actually born? Curious, one year she was listed as Jane, not Jennie. The 1886 St Paul MN directory listed her at 70 Douglas with her sons Lloyd and Louis (no, not a widow - polite way of treating divorced women in the 19th century) A new clue! 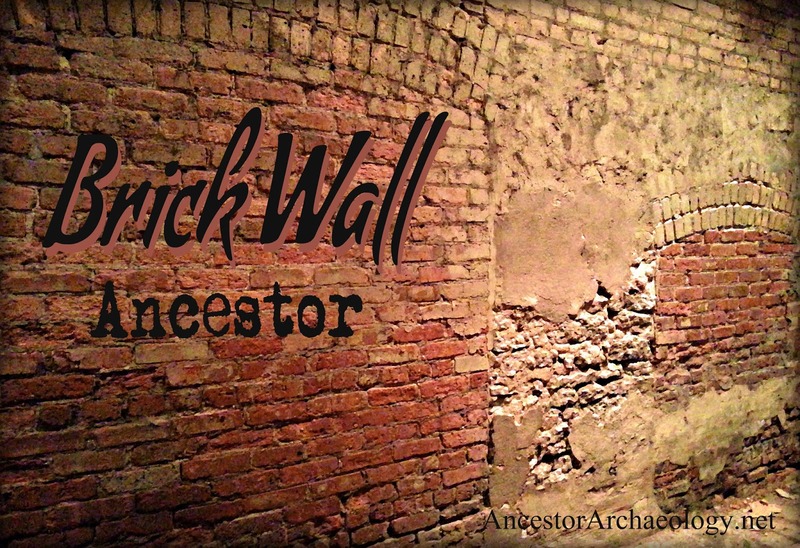 On FamilySearch I punched in "Jane Whitford" + Michigan and look what I found! Our girl Jennie had married Daniel Nichols in 1849. She was 16 and he was 23! Nichols! NICHOLS! Whoa, okay this might lead somewhere. E M Whitford and Elizabeth Whitford were witnesses - parents of Jennie, perhaps? Or siblings? Certainly relatives of some sort. They were from Niles, Berrien Co, MI which is about 130 miles southwest of Grass Lake. Time for more digging! But Jane and Daniel ARE on the census - living with a girl named Mary Woodford age 19. Sister? Seems very likely. Just the three of them, which would make sense if the 10 year old James Nichols living in Jennie's household in 1860 was her son by her first marriage! Jennie would have been very close to giving birth, perhaps Mary was there to help with the preparations. While I did not find an actual divorce record for Jane and Daniel, I did find Daniel getting married on the 7th of November 1856 (same year as Jennie and Harry's marriage) in Branch, MI. He married Minerva Shook and went on to have six children with her. His family is easily traceable. As for James Nichols, he bounced around, working as a farm hand here and there until he married Addie Blackburn in 1882; settling in Rice Co, MN, not far from his mother. He remained in farming and raised three children with his wife. Jennie's grandchildren unfortunately were all born after her death. Results from more digging, that I'm not going into here (if you're really interested contact me ~ mostly checking family trees, doing sideways research and comparing DNA results .... oh, and a lot of rabbit holes!) I discovered who I suspect are more siblings of Jennie's - three sisters and four brothers. There is speculation (family trees - some with DNA confirmation) as to the parents, but nothing that I have been able to confirm with documentation. But you have DNA you say. Yup. And we are all certainly related in some way, but the folks who match with the DNA all have used Online Family Trees as their source to prove parentage - not actual documents. What does the Magic 8 Ball say? 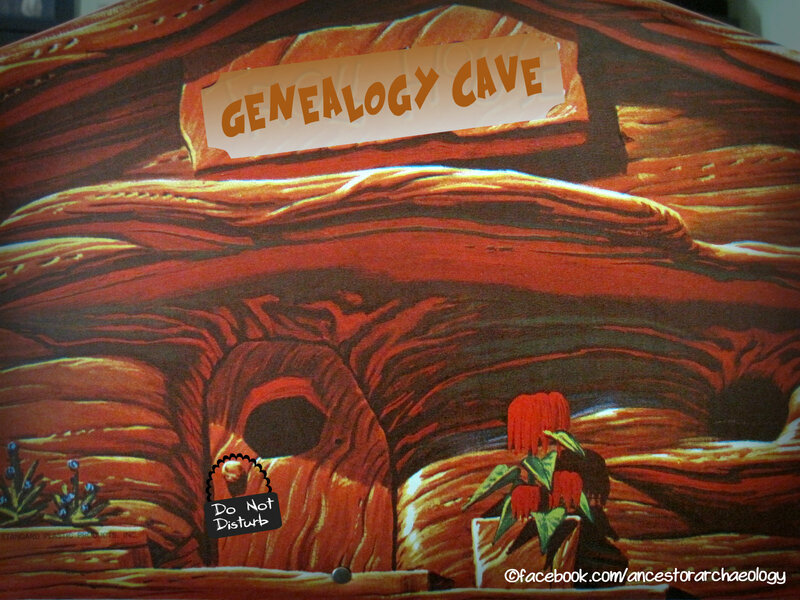 Probably "signs point to yes", but I'm not relying on the old 8 Ball to prove my genealogy. 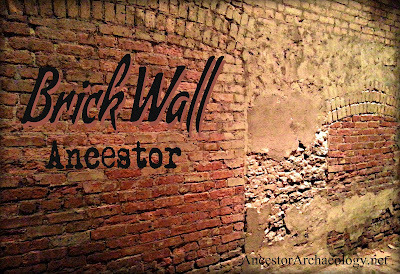 I'm going to label this Brick Wall as soft, perhaps a crumbling Brick Wall? This search is not over! Of interesting note: Dr Henry K Whitford was a professor at Bennett College of Medicine in Chicago at the very same time Jennie's son Lloyd was attending school there. Did Lloyd go to Bennett because his uncle was a professor there? Curious. Suspected parents of the the Whitford clan are David M Whitford and Elizabeth Lease. IF these are the correct parents they are last found in LaSalle County, Illinois in 1850. Elizabeth is in a Poor House and David is working his brother-in-law's farm. According to this sketch the family had fallen on very hard times. The trail goes cold after 1850. Well, before that too. I can't prove that this all fits together. It's the most logical explanation I have come up with to date. I am reminded of the notation on Jane's marriage to Daniel, however, witnesses were E M Whitford and Elizabeth Whitford. Could E M be a woman? Her sister Mary perhaps? Always more questions than answers! If any of this rings true to you please contact me and let's figure it out!